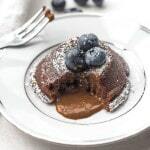 Mother’s Day is fast approaching and that means getting out all your cute, feminine recipes to treat your mama! 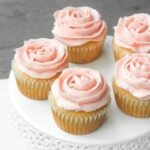 One of my favourite treats to make are these vanilla cupcakes with rose petal buttercream icing. 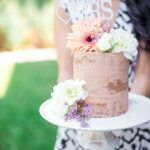 Gorgeous, girly pink tones make it so much fun to make and look at. Its fluffy, smooth texture keeps it light and airy. 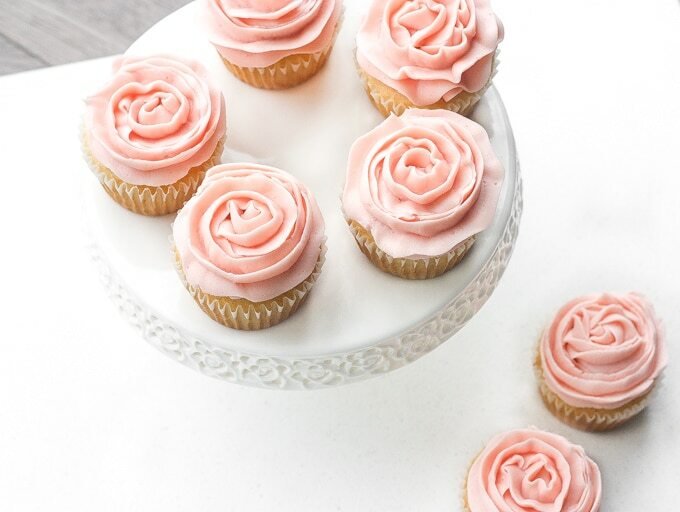 The rose petal icing is simple and super easy to pipe. So each of these points really only refer to the rose petal frosting because, let’s be honest, that’s the feature of this entire recipe. I mean, vanilla cupcakes are delicious on their own but a cupcake without any frosting is a very sad sight. It just doesn’t make any sense. 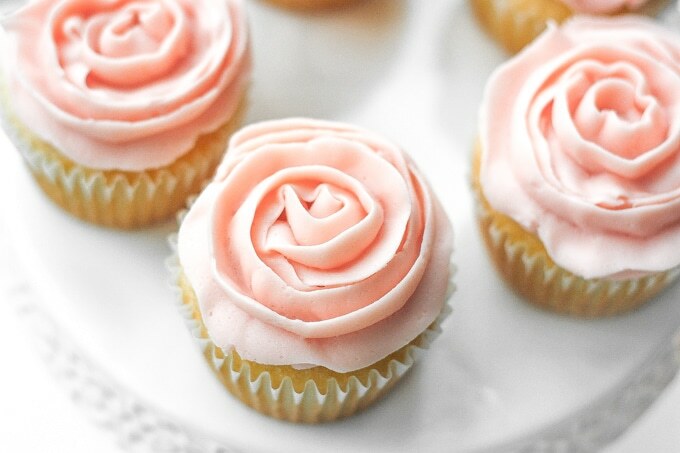 That being said, the only downside to frosting these rose petal cupcakes is that your mother may tell you that they are too pretty to eat. In addition to your cupcakes and icing, you will require a 2D star piping tip (I use the Wilton 2D tip and highly recommend it) and a piping bag (I use Wilton disposable decorating bags) . Secure the 2D tip onto the piping bag and fill up the bag with icing. In the middle of the cupcake, pipe a small amount of icing. Without lifting your piping bag, slowly work your way around, counter-clockwise, until you reach the outer edge of the cupcake. Make sure you use a lot of pressure to get the icing out consistently. Repeat these steps with the all the cupcakes. Preheat oven to 350 F. Line muffin tray with cupcake liners and set aside. Beat in the eggs one at a time until fully incorporated. Add in the vanilla and continue to beat together. Add the dry ingredients gradually, alternating with the milk, until fully mixed together. Fill up the cupcake liners 2/3 full with batter. Bake for 18-20 minutes. Using a toothpick, check that the centre of the cupcake comes out clean. Let cool for 5-10 minutes in the muffin tray. Transfer the cupcakes to a wire rack to finish cooling. In a large bowl, beat the butter using an electric mixer. Add the vanilla and mix together until light and fluffy. Add in the confectioners’ sugar gradually, mixing on medium speed. Add the milk and food colouring and continue to mix together until light and fluffy. If using liquid food colouring, you may need to add a little more sugar. Cover the bowl with a damp cloth until you are ready to use the icing. This was so moist and fluffy! Thank you for the recipe, it’s a keeper. The directions say to mix the butter and cream but cream is not listed with the ingredients. How much? 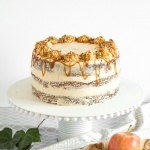 Love the way you styled the icing! Is there a tutorial somewhere? 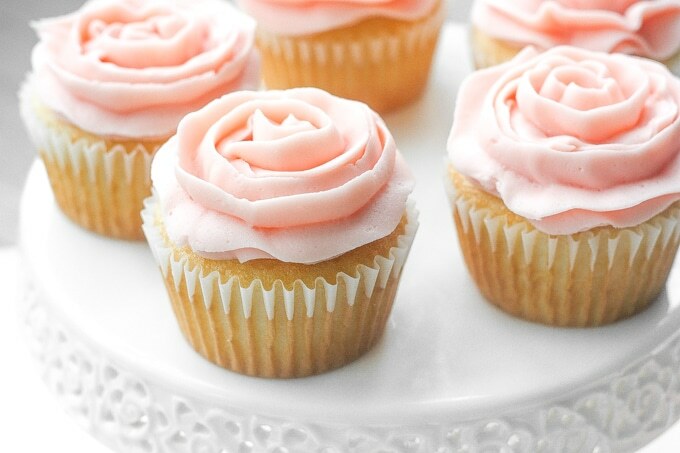 These cupcakes look very pretty, love the soft pink tone of the icing. Awesome Post! Love the who feel of the page design-wise as well! 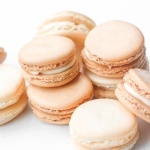 These are the perfect pretty pink for Mother’s Day or a tea party! And you make the icing trick seem so simple. Sigh. I can barely spread icing to look like peanut butter on a slice of bread. These are so gorgeous! What a great idea! You are so talented! I have never had a knack for decorating! And I know, even though you make it sound so easy, mine would never hold a candle to yours! I love getting out girly things for mother’s day. I need to make it more of a norm for day to day! I think it would add some love and life in the midst of toddler drudgery! Yes, more of a norm is a great idea:) It would definitely add some love and life! I think you must have a very steady hand – these all look perfect… perfect for a little taste. Really pretty. Sam these cupcakes are just beeeeautiful! Perfect for Mother’s Day. I don’t normally like “precious” food but hot dang, these are adorable and oh so pretty. I may even try the piping action. You make it sound so simple. On it. Thanks, Kristy! It is simple, just give a try 🙂 Let me know how it turns out for you! Beautiful cakes perfect for Mother’s Day. I was expecting them to contain rose essence from the description but even better that they don’t as I’m not a fan of flower flavours in my food! Well these are just beautiful Sam! I know my Mum… and me… would love these. The icing looks so perfect.. I just want to bite in! Sam!!! These are so so gorgeous! OH MY.. LOVE the blush icing! These cupcakes are so adorable and beautiful! I bet the girls and I’d have a lot of fun making these! These turned out just so beautiful! You are a master at making these! I love a good vanilla cupcake and these look beautiful!! These sound delicious! I can’t wait to surprise mom with them. Mmmm there’s nothing like a great vanilla cupcake! These are so pretty! You are most welcome 🙂 Thanks for dropping by! Buttercream frosting is my favourite! These cupcakes look amazing! What a wonderful idea! This is really great this coming Mother’s day. Love the rose petal. Aww this is a lovely cupcake! So cute ! 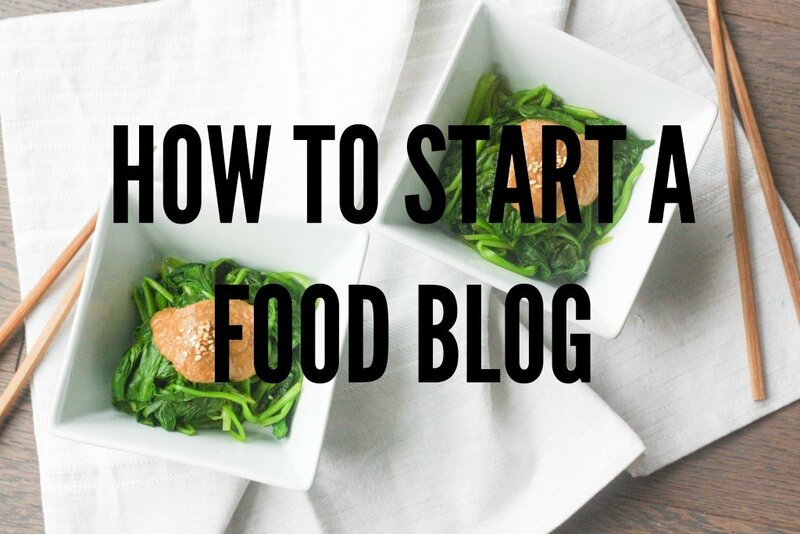 i will definitely try this recipe! These cupcakes are perfect for a delicious mothers day treat.I love the frosting. This is way better than a bouquet of flowers. 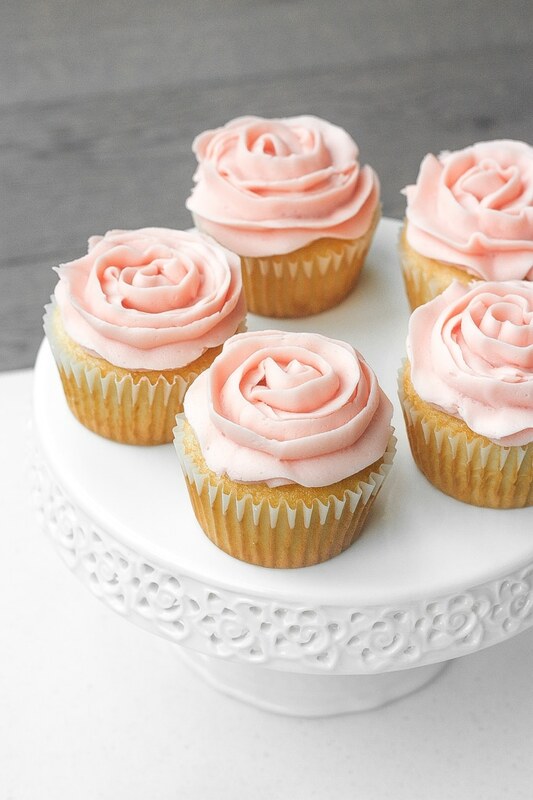 Seriously, what could be better than getting a bunch of cupcakes that looks like roses? It’s a win-win, you get your flowers and your desserts too. I love the idea and I’m sure moms from all over will appreciate getting these too. That frosting is absolutely gorgeous! And I love the color! My mom would love these! These look fantastic, and they sound like they are easy to make too! These look so yummy!!! 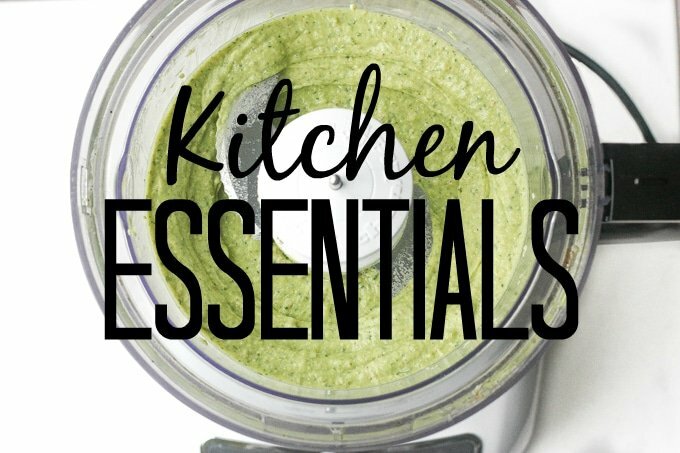 Thanks for making this printable to I can add it to my recipe book! Happy Mother’s Day! I want to eat like 43 of those right now! They look amazing.